Fresh Rose Petals are the perfect, easy-to-use accent to your wedding ceremony, reception or special event. If you need a custom assortment, please choose "Custom Pack" and specify your colors in the Special Instructons box on the Check Out page. We ship direct from Ecuadorian farms to your location. Free Shipping! Prices not valid for the 3-4 weeks before Valentine's Day. Normally, fresh rose petals will last at least 72 hours if handled properly. You will want to avoid two things: (1) Moisture and (2) Freezing Temperatures. Upon arrival, remove bags of petals from the box and inspect the petals for condensation. If there is too much condensation, open the bags, dry with a paper towel, and re-seal bag. Place bags in a refrigerator until ready to use. Avoid putting petals in a part of the refrigerator that is reaches temperatures below 35 degrees. They could freeze. For your Wedding or Special Event, we recommend that you have your fresh rose petals delivered 1 to 2 days before the actual event. For a weekend event, your flowers should be delivered on the Thursday or Friday. Deliveries are available Tuesday through Friday. We encourage delivery by Thursday. If there are any weather delays, that will allow an extra day for delivery. FedEx will not usually make a delayed delivery on Saturday. MyFlowerBuyer.com is not responsible for delivery delays. We can ship to Canada for a $40 per box surcharge. Shipments to Puerto Rico can be arranged. Please send an email to shipments@MyFlowerBuyer.com and we'll get back to you with your total order price. If you need a specific assortment, please order a Custom Box and specify up to 4 colors in the Special Instructions box on the Check Out page. We recommend delivery of fresh rose petals 1-2 days before your event. For a weekend event, we suggest delivery on Thursday or Friday. A 6,000 petal box will have 13 bags of 200 grams (.44 lbs. ), approximately 460 petals each, depending on the variety. It should cover an area at least 9 x 15 feet. A 12,000 petal box will have 26 bags. It should cover an area at least 18 x 30. Rose petals come in separate plastic bags, making them easy to decorate your area and transport around the site. 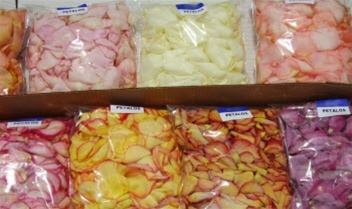 Substitution Policy - While we make every effort to provide the exact fresh rose petal color you order, sometimes a substitution may be required to assure your fresh rose petals are delivered on time. If so, we are careful to make your order as close to your original choice as possible, even if this means substituting rose petals of greater value. While our goal is to always keep you informed, we may ship a substitution without confirmation from you.